The aforementioned cold front from yesterday’s FTB and FTO has made its way through eastern Colorado this morning. This is brining quite the cool temperatures to the eastern plains with current temperatures in the upper 30Fs to mid 40Fs. Behind the front, there are some low-level clouds and fog as seen in the visible satellite imagery below. Light showers are also being reported over the Southeast Plains. Flow aloft will also turn more westerly today as the trough continues to migrate east and the upper-level high moves over NM/AZ. This should help entrain a drier air mass from the west. The front is rather shallow, so expecting clouds to dissipate west to east as deep mixing occurs in the boundary layer with the drier air aloft this afternoon. Moisture is a bit deeper over the Colorado/Kansas/Nebraska border, so forecasting skies to remain overcast. Light showers will be possible throughout the day but not expecting 24-hour totals to exceed 0.15 inches. Due to the shallow nature of the cold front, only the eastern plains and lower elevations of the eastern high terrains will have afternoon high temperatures affected. This means sunny skies and warm temperatures for the mountains and western Colorado. 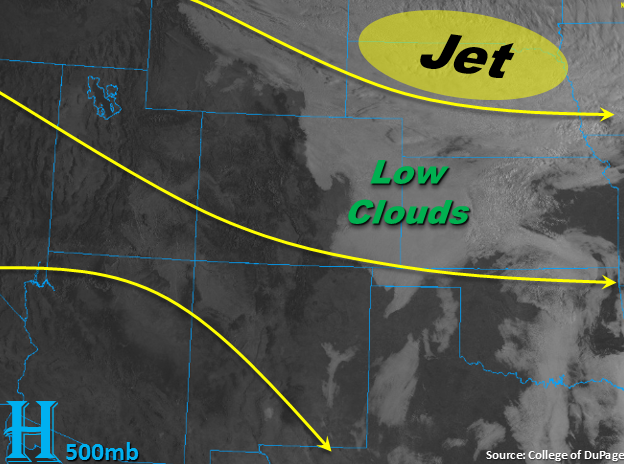 Tonight, expecting cloud cover to increase as a shortwave moves clockwise around the 500mb high into western Colorado. This should help keep low temperatures a few degrees higher than the last few nights across the state. 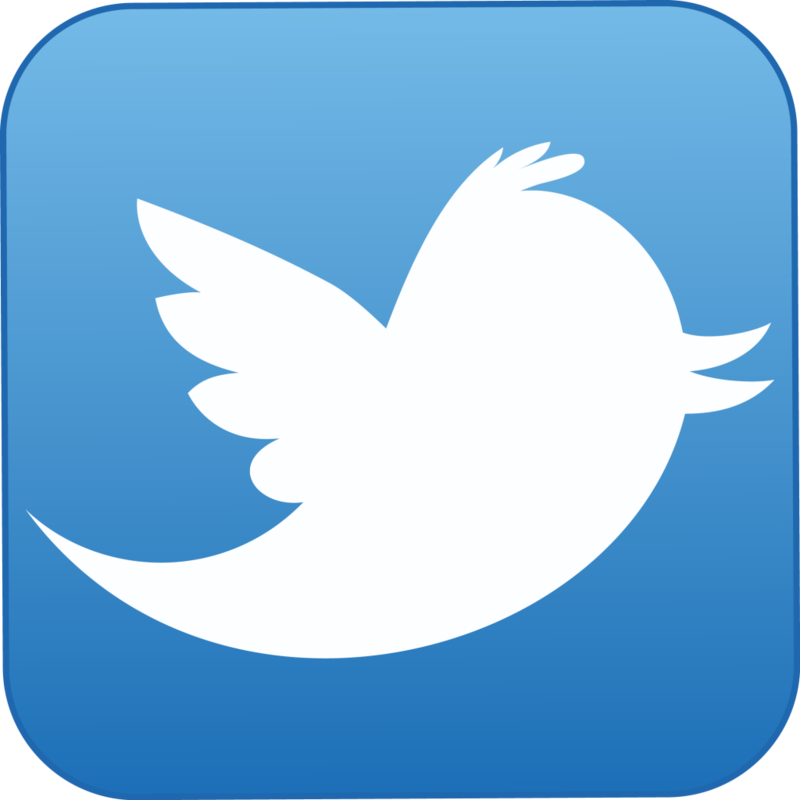 As you may have predicted, flooding is not expected today. Cooler high temperatures today thanks to the passage of a cold front. Highs today over the plains will be in the mid-50Fs with temperatures warming into the low 60Fs over the adjacent plains. The mountains will remain mostly unaffected by the cold front minus the foothills. Cloud cover is expected to decrease west to east this afternoon, although overcast skies will remain over the far eastern plains. With limited low-level moisture and instability, light showers and drizzle will be possible west of 104deg as well as over the northern Front Range/Cheyenne Ridge intersect. Totals for the 24-hour period are expected to remain under 0.15 inches, so flooding is not expected today. The shallow cold front should leave these regions unaffected today with highs reaching the mid 80Fs over the lower elevations. With westerly flow aloft, dry air entrainment will keep skies mostly clear, so plenty of sunshine to go around. This evening a shortwave will rotate around the 500mb high, so cloud cover will increase from west to east. This will keep low temperatures warmer than the last couple of days as radiative cooling will decrease. After some of the coldest morning temperatures of the season to start the day yesterday, most places warmed up considerably during the day as high pressure sliding off to the east ushered in warm southerly winds. With high pressure at the surface and very dry air throughout nearly the whole depth of the atmosphere, precipitation chances are essentially zero statewide today and temperatures are expected to be near or a bit above seasonal averages. There is, however, a strong cold front lurking to our north, and while it will be unable to break the dry pattern across Colorado, it will mean the coldest day of the season so far east of the divide come tomorrow. The front’s late-morning position today has been drawn on the map below, with moister areas on the water vapor imagery nicely highlighting the influence of the jet stream and cold front. Further south, desert air sits over much of the state with just isolated pockets of high-level cloudiness across the northern tier of the state. 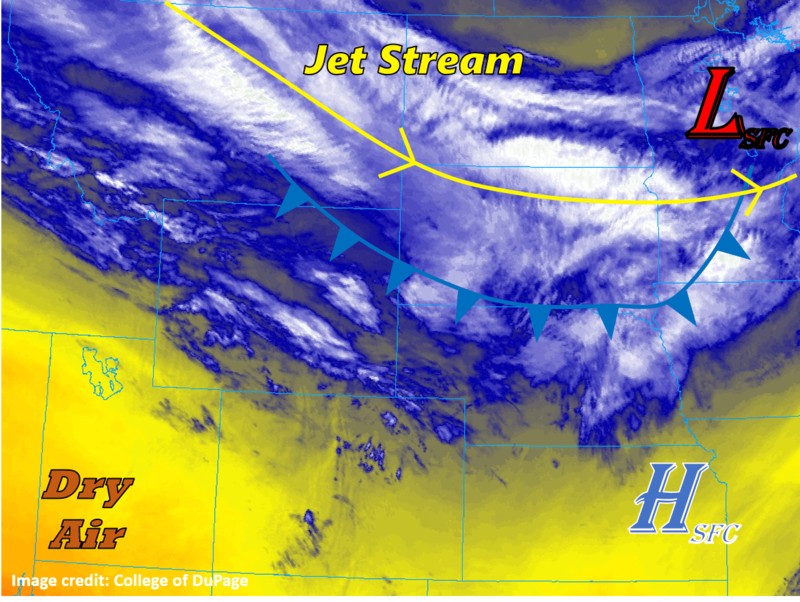 As the jet stream once again dips a little further south over the northern plains, it will help to push the cold front further south today and tonight, but it should remain north of Colorado through this evening. By the early morning hours of Friday, it will have passed through most of northeastern Colorado, and should reach southern Colorado by mid-day tomorrow. The pool of cold air associated with this feature is quite shallow, so the dramatic drop in temperatures may not even be felt in the mountains and foothills above 8000-9000’ above sea level. Many locations in the northern plains and urban corridor may experience their high temperatures for tomorrow at midnight tonight, as temperatures may drop 20+ °F behind the front and only recover into the 50s °F during the day tomorrow. In short: little in the way of sensible weather across Colorado today, but big changes are on the way for the eastern half of the state overnight. Mostly sunny and seasonably warm today as predominantly southwesterly winds carry dry desert air into the region. Low relative humidities may enable some growth of active fires like the Silver Creek and Ryan fires, but wind gusts and temperatures should be low enough to prevent any errant behavior or rapid growth. A few clouds may drift overhead from time to time across the northern half the state. Tonight’s cold front will not affect these areas. A mostly sunny and seasonably warm day is in store for the northeast 1/3rd of the state today, with temperatures running around 5-10°F above normal. Expect the cold front to reach the northeastern corner of the state after midnight tonight and be through the Palmer Ridge by sunrise Friday. Southeastern reaches of the state will not be affected by the front until tomorrow morning. After a long stretch of hot weather to begin September over much of Colorado, a series of cold fronts over the past few days have finally begun to usher in more fall-like temperatures. In fact, many locations in the plains had their coldest temperatures of the new cold season so far today, ranging from just below freezing in spots to the low 40s °F across the southern plains. The cooler temperatures are the result of Canadian surface high pressure, which has been shunted southward into the region by northwesterly winds aloft. 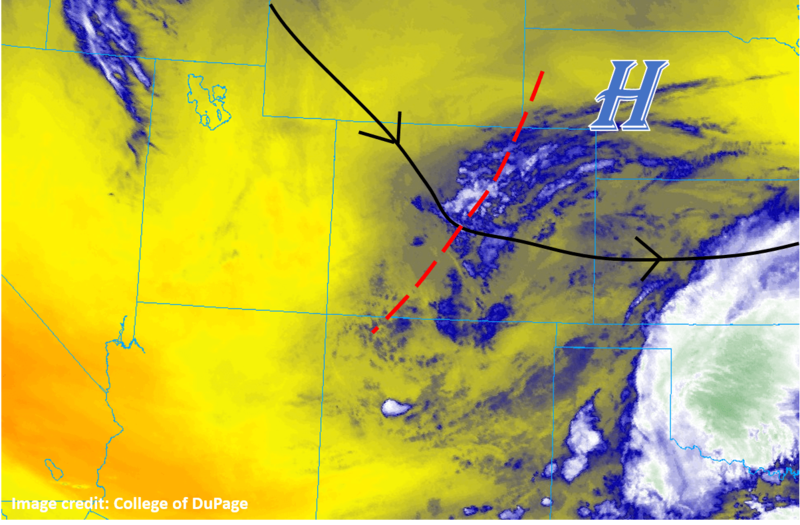 A compact and fast-moving shortwave trough (dashed red line) is embedded in the upper-level flow, providing just enough lift to produce a few clouds from the Front Range and Denver metro to points southeast. These features are illustrated in the annotated map of satellite water vapor imagery below. As this shortwave zips off to the east this morning, drier air will take hold, leading to mostly clear skies across much of the state for the middle part of the day. The exception to this will be along the southern tail of this feature, which may still have enough energy and moisture with it to fire up some isolated thundershowers across the far southern tier of counties in the state. A few forecast models indicate convection starting late this morning that should push rapidly off to the southeast, possibly visiting the northern portions of the Raton Ridge and before pushing out of the state. The limited moisture and strong winds aloft will limit both the intensity and persistence of these showers and storms, and therefore no flood threat is anticipated. Additionally, more clouds may work their way into the northern reaches of the state by this evening, associated with the next push of shortwave energy. Cloudy and seasonably cool to start with this morning. Isolated to scattered showers may build late this morning, initially across the higher terrain. These may survive the push off the mountains onto adjacent lower terrain in the San Luis Valley, Raton Ridge, and western Southeast Plains. Any rain that does develop will be pushed along by robust winds aloft, thereby limiting any flooding potential. Rainfall rates will generally be in the 0.05 to 0.25 inches per hour range, and isolated spots along the New Mexico border that receive the most frequent showers today may approach 0.5 inches of total rainfall. Clearing skies this morning with temperatures running just a few degrees below seasonal normals. Expect a strong warm up today with plenty of sunshine and winds turning westerly over western portions of the state and southeasterly on the eastern plains. Mid- and high-level clouds may begin working their way into northern portions of the state by the evening, but no precipitation is anticipated. 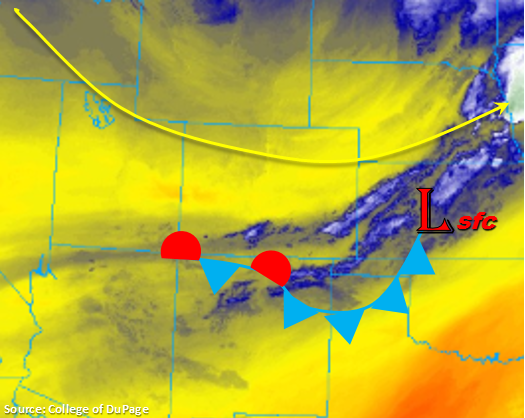 A secondary cold front dropped through the state early this morning and is currently over the Texas panhandle. Breezy northerly winds are being experienced behind the front over the eastern plains this morning with temperatures in the mid 40Fs to 50Fs. A Frost Advisory has been issued for the northern Front Range and Urban Corridor tonight as temperatures today will only reach the mid-60Fs and drop to 28-32F overnight due to the cold air mass remaining in place and light winds. Increased low-level moisture behind the front has created some light upper-level clouds over the Front Range and along the front, but the shallow moisture is mixing out quickly with the sunrise. Despite the cold front passage, the northern 2/3 of Colorado already has dry air filling in behind the front. This can be noticed by the shades of yellow over the majority of the state. The exception is over southern Colorado where a little better moisture is able to hold on with more westerly flow aloft rather than northwesterly flow aloft. Upslope flow is expected to initiate showers and weak thunderstorms this afternoon with surface winds turning from more northerly to northeasterly over eastern Colorado. While some spotty, light showers may form over the high terrains, the best chance for afternoon rainfall is expected over the southern Southeast Mountains and Raton Ridge due to the better moisture over the region. Storms are expected to be high-based with dew points in the 30Fs, so that should limit totals with brief gusty winds possible. A few showers may linger eastward overnight into the Southeast Plains as there are some upper-level dynamics at play. Over western Colorado, skies will be mostly clear with some cloud cover likely over the San Juan Mountains this afternoon. Flooding is not forecast today. Temperatures today will be a 10-20F degrees cooler than yesterday with highs in the 60Fs for most of the lower elevations. Light winds tonight with the cold air mass over the region will drop overnight lows near freezing. A Frost Advisory has been issued for the northern Front Range and northern Urban Corridor due to temperatures dropping between 28 and 32F. Some upslope showers are expected this afternoon over the higher terrains. Showers to the north will be rather spotty in coverage with totals under 0.1 inches. Further south over the southern Southeast Mountains and Raton Ridge, shower and weak thunderstorm coverage will be the greatest. Storms are expected to be high-based, so some brief windy conditions are possible with max 1-hr rain rates up to 0.2 inches. A few storms may linger eastward overnight into the Southeast Plains, but totals will remain under 0.15 inches. 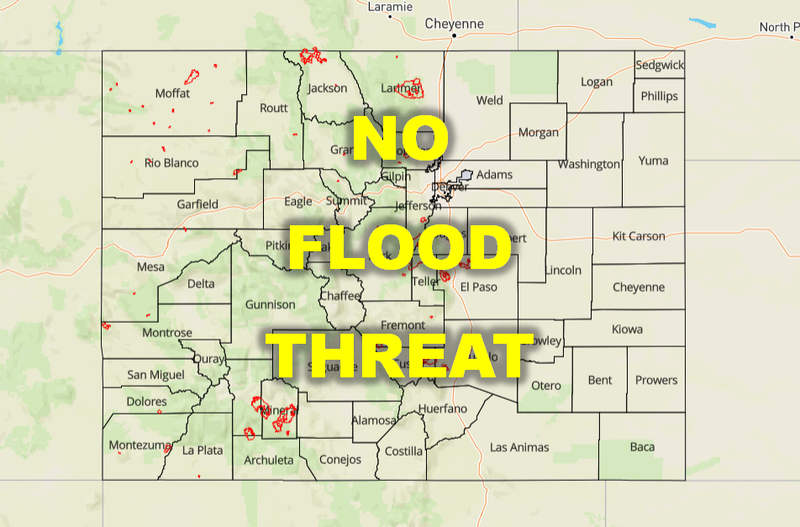 Flooding is not expected today. Cooler temperatures are also expected over the northern half of these regions this afternoon with higher temperatures over the Grand Valley and Southwest Slope. Without much moisture, rainfall is not anticipated this afternoon. Expecting mostly clear skies with some scattered cloud cover over the San Juan Mountains. Today, there will also be a break from enhanced and critical fire weather. Hopefully crews are able to make some progress with the ongoing wildfires across the state.